In what could take the sheen off many of the glittering function halls in Visakhapatnam, it has emerged that around 90% of function halls in the city do not possess No Objection Certificates from the Fire Department. An NOC is granted only when a function hall is found to be in compliance with all of the mandatory fire safety rules prescribed by the Fire Department. That most function halls in the city have failed to obtain the NOCs should come as a cause of concern for those selecting these venues to hold their weddings. There are 143 wedding halls in the city limits, of which 91 are private ones. According to statistics available with the fire safety wing of the Greater Visakhapatnam Municipal Corporation (GVMC), only eight of these private halls have obtained NOCs. Those without the NOCs include several well-known ones in MVP Colony, Seethammadhara, Madhavadhara, Gopalapatnam and Gajuwaka among other areas. Even the status of the 52 function halls owned by the government is not encouraging — only about 10% of these halls have obtained NOCs. Confirming that only eight private wedding halls possess the mandatory NOC, Regional Fire Officer (RFO) P. Swamy says several show-cause notices have been served on the function halls asking its owners to comply with the norms, but the latter pay no heed. Function halls must install proper firefighting equipment at an adequate number of places on their premises, and should have wide staircases as well as multiple entrances and exits. The halls must also be located in areas that will allow easy access to fire tenders during emergencies. Fire officials say the norms vary depending upon the size of the building. Function halls which are below 10 metres in height should have water tanks on the terrace, a booster pump, a manually operated call point (MCOP), water drums, and sand. For a building that is over 10 metres in height, heavy pumps, a water tank with a capacity of 1 lakh litres installed on the ground, fire detection systems and alarms, wide staircases, and multiple entrances and exits need to be in place. "Whenever we serve notices, the managements cite various excuses. They say fire safety equipment is expensive and that their scale of business does not allow them to afford it. But we make it a point that the NOC is not issued unless the function halls ensure 100 % compliance," Mr Swamy told The Hindu. 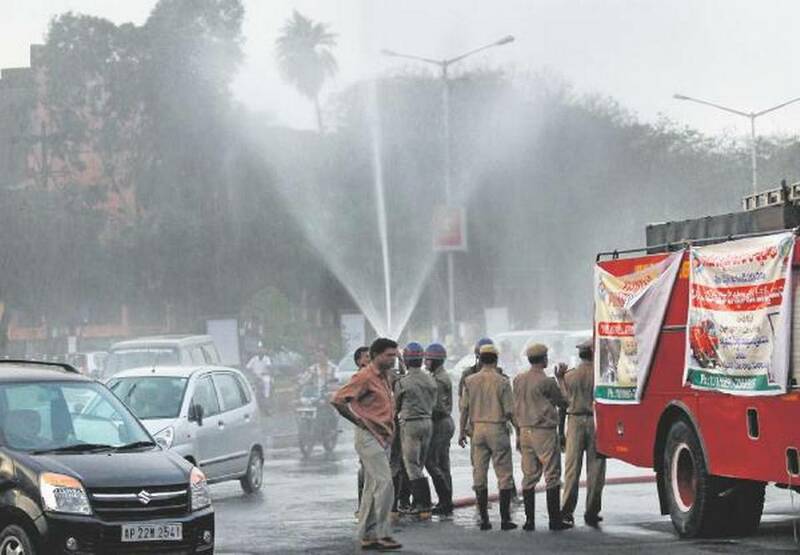 After 90 days, a letter will be sent to the Director-General Fire Services seeking permission to take action against the erring function hall managements," Mr. Swamy said. Apart from lack of fire safety, another major issue bedeviling visitors to function halls in the city is the lack of parking space. While a few halls have small cellars which can accommodate a handful of cars, many halls do not have even those, forcing visitors to park their vehicles on the road. Doing so results in either a parking ticket or the vehicle being towed, not to mention the severe traffic congestion that this causes. Function halls where this problem is most severe are the ones situated along NH-16 in areas like Isukathota Junction, Venkojipalem, Gajuwaka, and NAD Junction where traffic congestion is a perennial problem. Even in lanes and bylanes of areas like Peda Waltair, MVP Colony, Akkayyapalem, One Town, and Murali Nagar, visitors park their vehicles on both sides of the road, causing traffic bottlenecks, a police officer from the Traffic Department said. Asssistant Commissioner of Police (ACP-Traffic) K. Prabhakar said they been asking the function hall managements to provide parking facilities, but in vain.